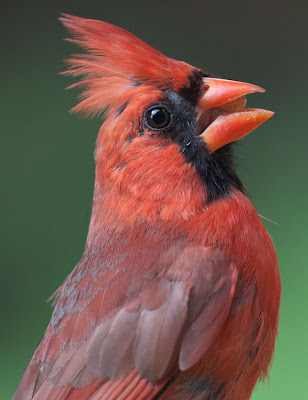 Last May I photographed a bunch of garden birds and a few critters from a single open window in a New Jersey suburb. It was for a daughter's school science project, which is code for "father's science project competition." I became a little obsessed with capturing the sheer featheriness of birds without losing detail by boosting contrast for visual drama. Available light only. The cardinal shown is the state bird of New Jersey. What Americans call a robin is nothing like the real thing, but the American grey squirrel is the same that colonized England and is still hyperpowerful. 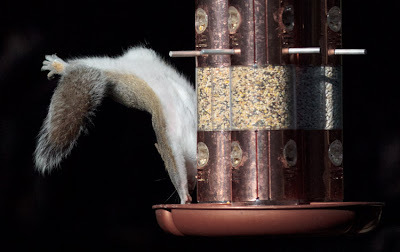 It would make an apter national critter than the bald eagle - it's acrobatic, persistent, can take a big fall, is ruthless to rivals and some of them still have nuts.